I got one of my favorite Christmas gifts of all time this year: a letter from my 12 year old father. After my father died, my Mom eventually moved into a smaller house. It didn't make sense for her to be living in a five bedroom home all by herself, and we thought it would be nice to have her closer to where her kids were living in case she needed anything. Unfortunately, having a five bedroom home meant five bedrooms (plus living, family and dining rooms and a large workshop) worth of stuff to pack. It was overwhelming at the time, but after many trips to Goodwill and a giant garage sale, we were able to fit her into the two bedroom home in which she now resides. During that process, whenever we came across anything sentimental that we couldn't bear to throw away, we tossed it into a "keeper" box. Then another. Pretty soon we had a stack of these boxes, but with no time to go through them they ended up in my brother's garage to be perused at another time. My father was in the Boy Scouts throughout his childhood, and was shipped off to camp every year. 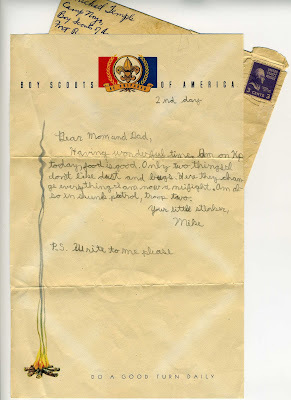 I love this letterhead, and I love how my grandmother made out the envelope and put the (3 cent!) stamp on it to ensure her only child wrote to her. I also like how, instead of a date, he wrote "2nd day". Having wonderful time. Am on Kp today, food is good. Only two things I don't like dust and bugs. Here they change everything. I am now a neifight*. Am also in skunk patrol, troop two. P.S. Write to me please. It kills me to read that he didn't like the dust and bugs, considering what he put us kids through during our childhoods: Annual autumn firewood gathering trips where we worked in the hot sun chopping down unwanted trees from his friends and co-workers orchards/ranches/backyards; camping out at the coast in the wind and sand; one particularly awful trip where we tried to sleep on the boat while moored in the Sacramento Delta, mosquitos swarming around our sweaty heads so thick that in the morning we found dead ones caked to our faces where we had swatted them in the night. I know he was only twelve when he wrote this, and he probably missed his parents something fierce. I like his postscript: Write to me please. Something from home always makes things better.